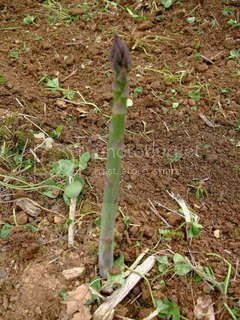 the last day of March and I was weeding the garden, thinking thoughts of fresh salad this spring and tomato sauce in mid summer, when LOW and BEHOLD I saw a spear of asparagus sprouting up. then as I inspected the rest of the patch I saw ALOT of spears peeking up through the soil!! 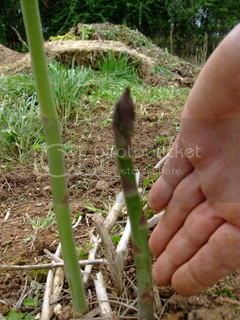 there is a blog entry from last year here where I initiated my plan and put in a bed of asparagus crowns. they grew well and I resisted all temptations to eat any last year. after letting it grow up, die off and over wintering, I have been anxious and was quite surprised to see some of it peeking out already. I thought it was too early, we have had a very wet cool spring ( so far). I thought it would be a good idea to inter-plant clover between rows for weed suppression. not bad in theory, but i should have planted crimson clover instead of white clover. reason: white clover has spread and almost over taken some of the rows. crimson clover would have died in the freezes over winter leaving only green manure and fixing nitrogen to the soil. I spent quite a bit of time hoeing (sp?) out the white clover. lesson learned. I will mulch the beds in a few days to further assist in keeping weeds back. on another note, I have planted onions, cauliflower, beets, radishes and carrots so far. Only the onions , lettuce beets and my cauliflower transplants are up . In a friends greenhouse I have tomatoes and peppers started. Happy gardening- Spring hath sprung!! Todd -- This is awesome! Amazing this soon. I am soooo jealous! 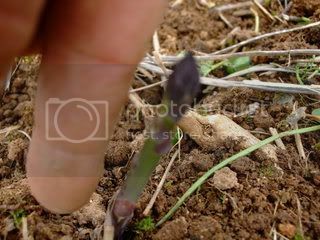 Well thos asparagus shoots looks extremely healthy and strong don't they? I would have been chuffed to bits too to see them appearing so early. I hope they go from strength to strength for you and that you thoroughly enjoy eating them when they are ripe. 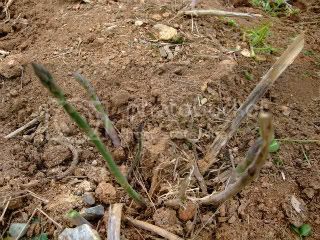 your asparagus is looking relly good. Will this be your 2nd yr for them? good job. Mmm, fresh Asparagus! 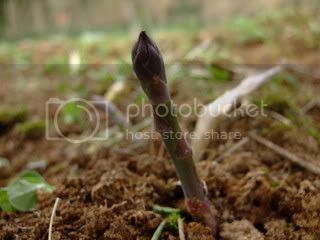 I am eagerly awaiting fresh Asparagus spears from the garden. Yummy! 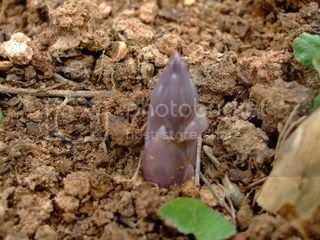 We've planned to plant asparagus too, but haven't so far. Our to-do-list is growing yearly.